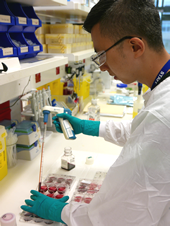 We provide support and training opportunities to laboratories in the Asia-Pacific region that contribute to the Global Influenza Surveillance and Response System (GISRS). In order to meet national needs and to play a role in GISRS, our regional partners require appropriate resources and expertise for laboratory-based detection of influenza virus and submission of samples to a WHO Collaborating Centre. Strong diagnostic and processing capabilities help regional laboratories to fulfil their key role in in global influenza surveillance and improve pandemic preparedness. Our Centre provides technical support and training to laboratory staff, as well as advice regarding equipment and methods for laboratory-based detection of influenza virus. Our partners include WHO Western Pacific Regional Office (WPRO), WHO South-East Asian Regional Office (SEARO), the Secretariat of the Pacific Community (SPC), Regional Emerging Diseases Intervention (REDI), and the Centers for Disease Control and Prevention (CDC). Training on site at regional laboratories. A specialist staff member from the Centre visits the regional laboratory to help establish and/or provide training in specific techniques for detection of influenza virus. Regional workshops held at the Centre in Melbourne or a regional venue. Laboratory scientists and managers from different countries convene for a multi-day workshop focusing on specific technical methods of influenza detection and analysis. Training is provided by specialists from the Centre and generally combines both background presentations and practical hands-on exercises. Workshop attendees have an opportunity to meet and exchange experiences with other influenza scientists from the region. In-house training held at the Centre in Melbourne. Staff from regional laboratories spend several days with specialists at the Centre to gain detailed understanding of specific techniques to detect influenza virus. The Centre maintains an ongoing role in advising and supporting regional laboratories as they establish and strengthen their technical capabilities. Please contact us if you would like to know more about training opportunities with the Centre in Melbourne. Songha Tok (left) and Sonita Kol (centre), from Institute Pasteur, Phnom Penh, Cambodia, and Sovandara Om (right), from the National Institute of Public Health, Phnom Penh, Cambodia, are visiting the Centre on 22 October - 2 November 2018. Sonita and Sovandara are undertaking training in surveillance techniques for influenza detection and characterisation, while Songha is training in specialised serology techniques for the characterisation of viral isolates. Ms Jacqui Ralston (pictured below), a scientist from the Institute of Environmental Science and Research (Wellington, New Zealand) visited the Centre from 3-15 September 2018. During her stay Ms Ralston undertook training in the Focus Reduction Assay (FRA) for the antigenic characterisation of A(H3N2) viruses.